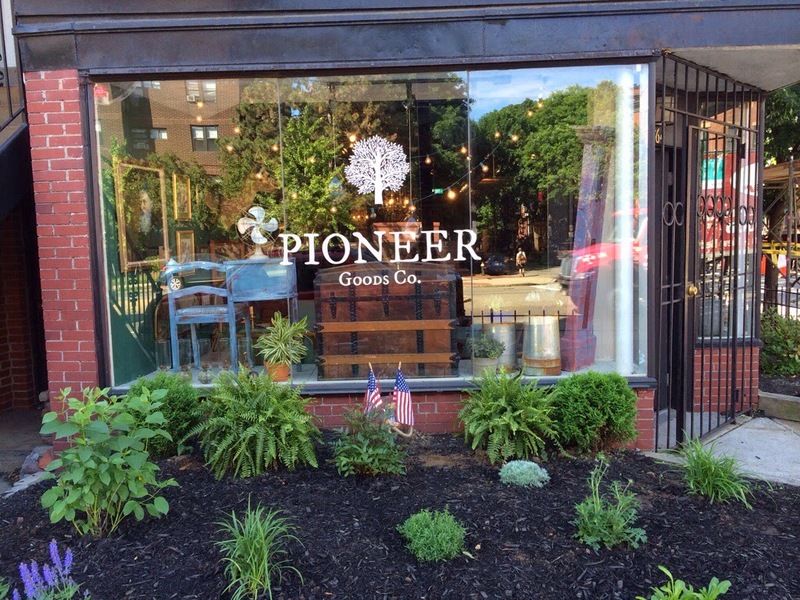 Pioneer Goods Co shop preview this weekend! 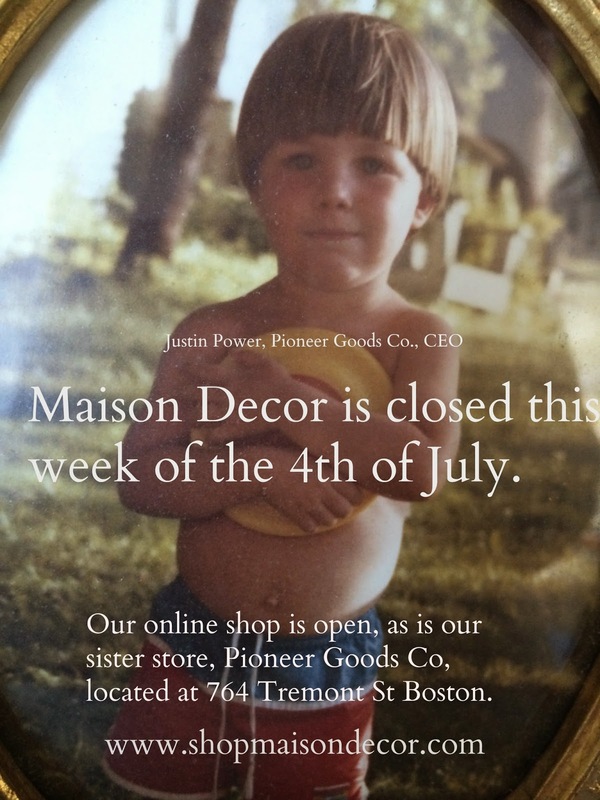 for all of our followers and neighbors who have been excited about the shop. city~they haven't been the easiest folks to deal with. 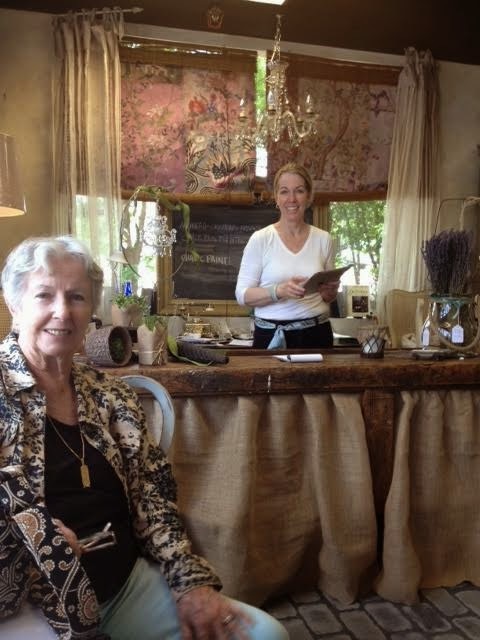 Small businesses (they say) are the backbone of America. We have already hired two guys to work in our little Boston shop. and telling us that they are sooooo happy we are there! to host a Preview Weekend....hey we do have our bills to pay. 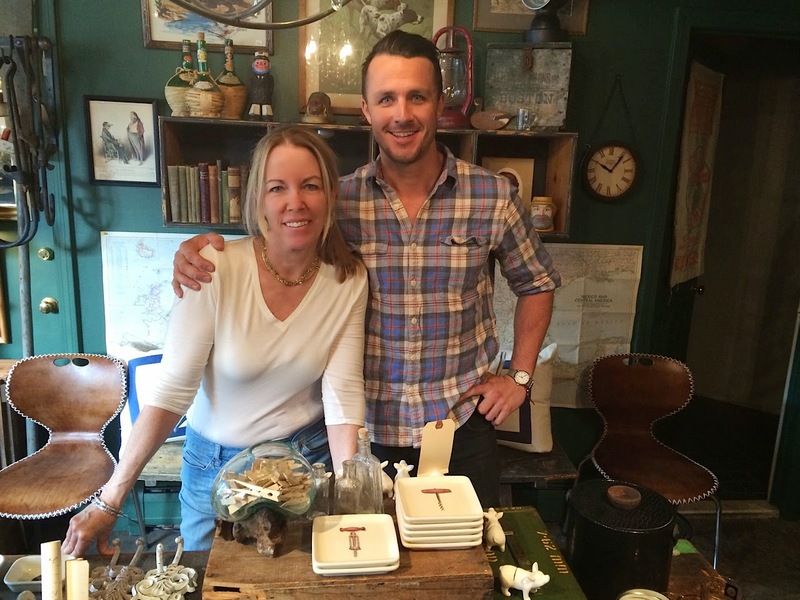 Justin has created a little masterpiece of a shop! 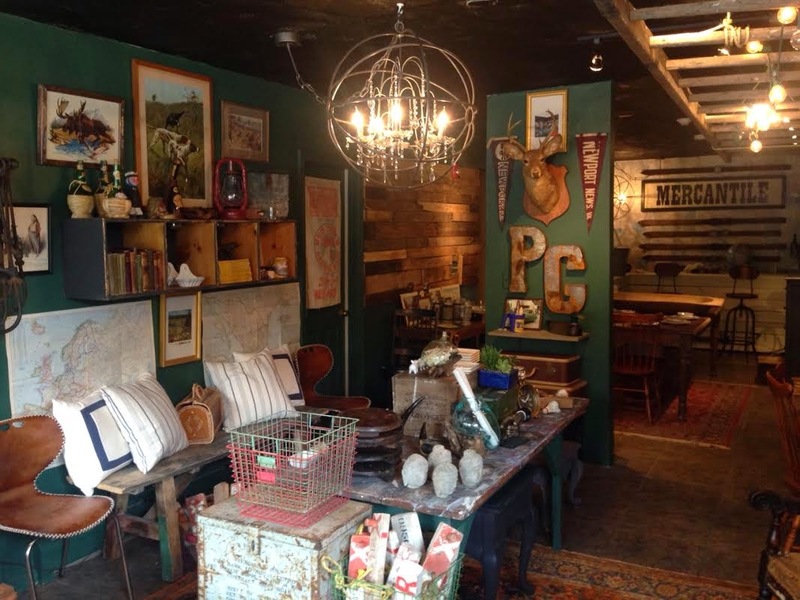 Filled with antiques, vintage goods and reproductions, its just fantastic!! I cannot wait to visit it myself~believe it or not, I have only been twice. Sunday when Maison Decor in Reading is closed. as well as all the other amazing pieces he has amassed to create his look. Read Justin's blog post for more information here. 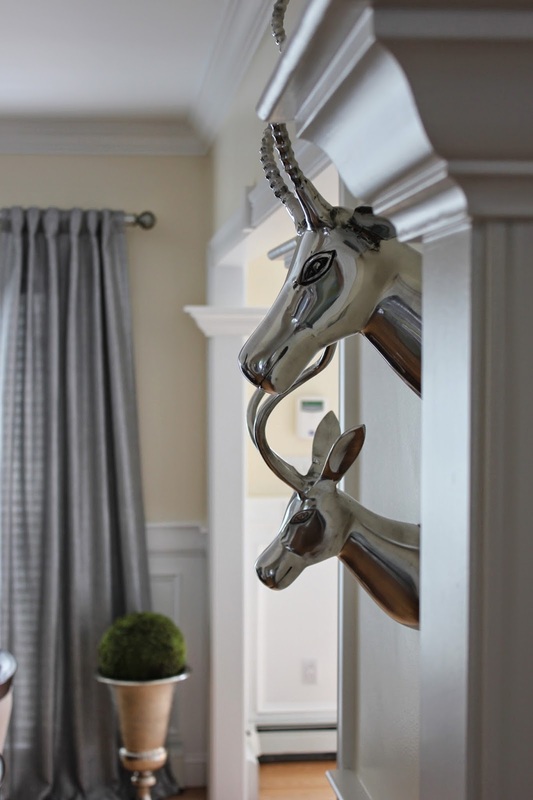 finishes, from chrome to silver leaf found on fabrics and fixtures. from becoming too cool with all of the silver and grey used. 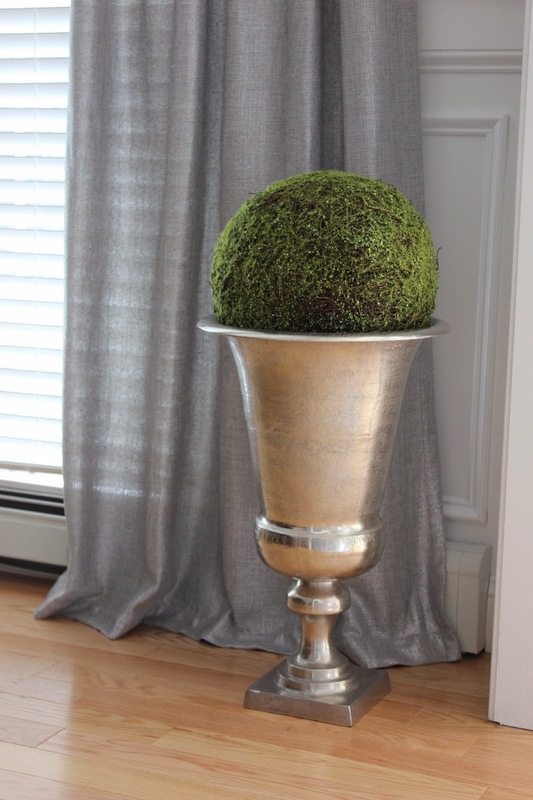 linen draperies create the glam vibe we were aiming for! found at HomeGoods and add a bit of on trend whimsy. Animal heads are IN IN IN!! 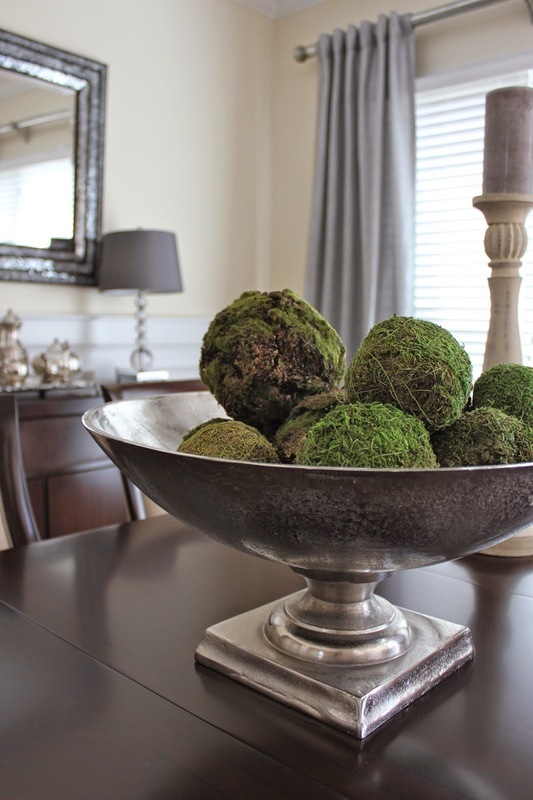 with a rustic silver urn holding a giant moss ball orb. Yin and yang~the silver and the moss. and tones down the formality from all the sparkle and shine. 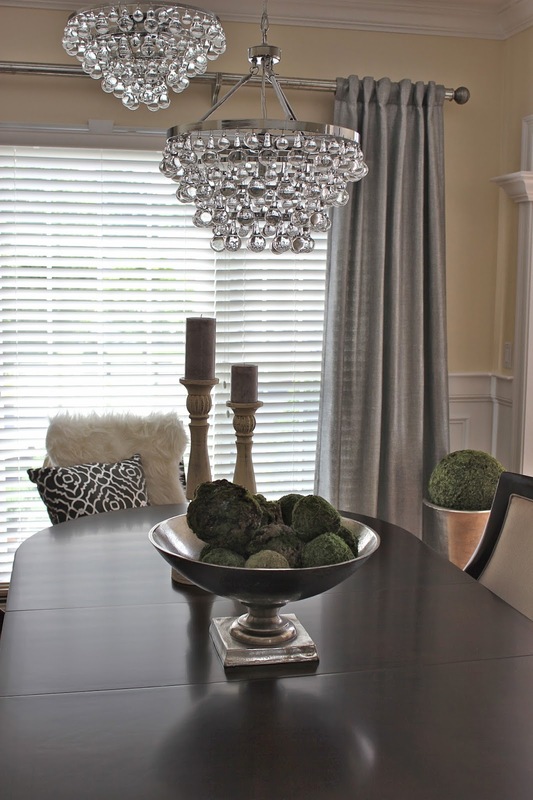 This centerpiece is from HomeGoods too. elegance to the room. 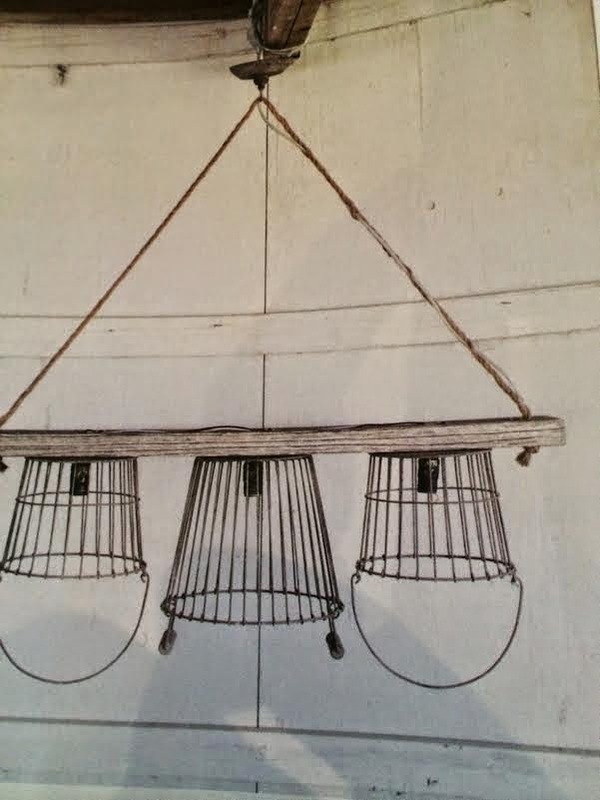 The drapery panels are from West Elm. 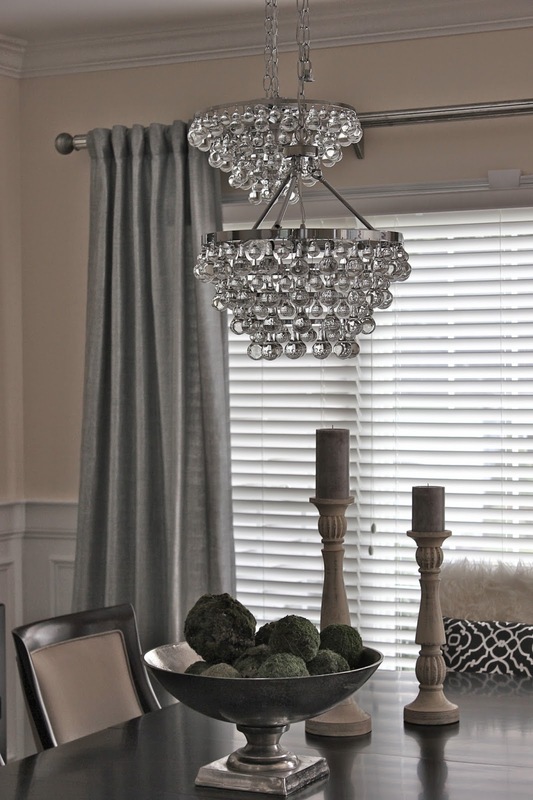 The drapery rods are custom from Maison Decor (my shop). from crushed bits of mirror. It is both stunning and unusual! to flank the mirror, and the client's grandmother's silver tea set. Here is the view to the foyer and the front door. 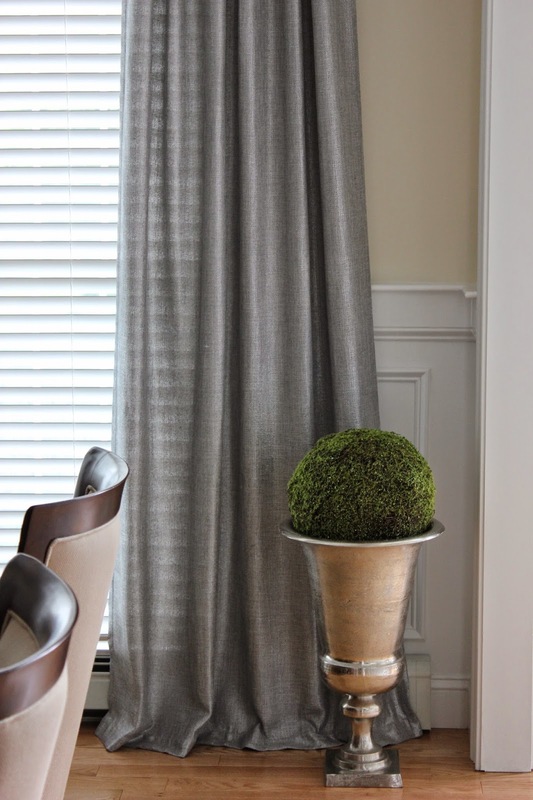 You can spy one of the Maison Decor wool rugs in Bermuda grey. Note: This post is partially sponsored by HomeGoods as part of my participation in their Happy by Design Pinterest designers board. Its almost finished, our little coffee bar. when there are more than two people in the kitchen. our own days, the coffee bar has been an excellent addition! 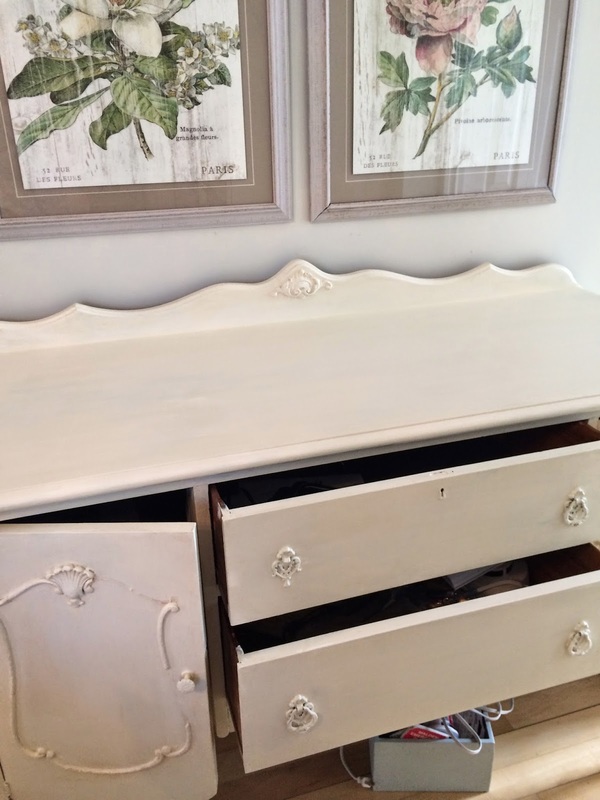 It started off by getting two coats of Old White Chalk Paint by Annie Sloan. on how this can solve your bleeding problems. It was looking so fresh and pretty with the white paint. on the drawers and the centers of the panels. I just love these stripes!! How do you like Dillon's photo bomb? I wanted to share how much of a difference a rug can make in a room. And AFTER with a pretty blue geometric wool rug from our shop! I think its a WOW! I spent Monday working with my new Design Assistant, Gina. We did a Restyle on this condo for a lady. It came out fabulous! anyone can do with their own stuff. 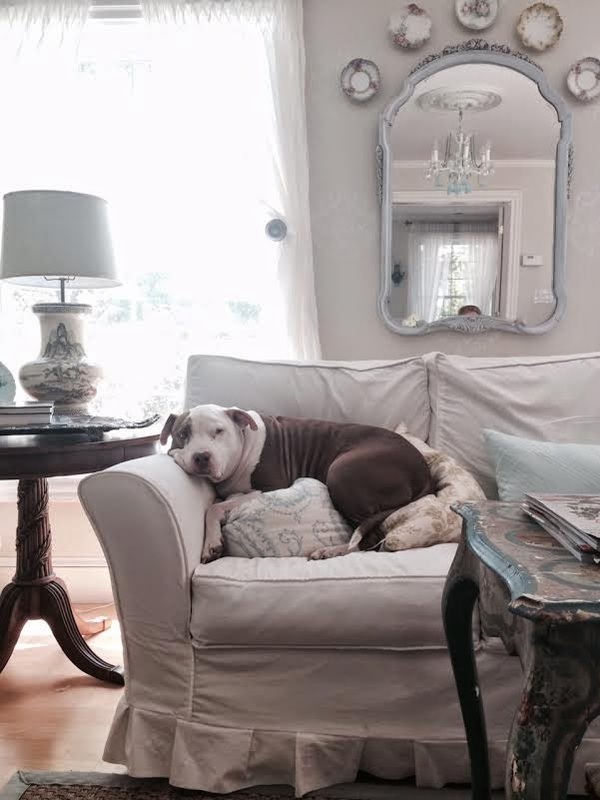 See the ottoman we used for her coffee table? It was in her bedroom at the foot of her bed. It came from HomeGoods! Note: this post is partially sponsored by HomeGoods as part of my affiliation with their Pinterest Happy By Design board. All opinions are my own. I made a few collages of projects from start to finish. 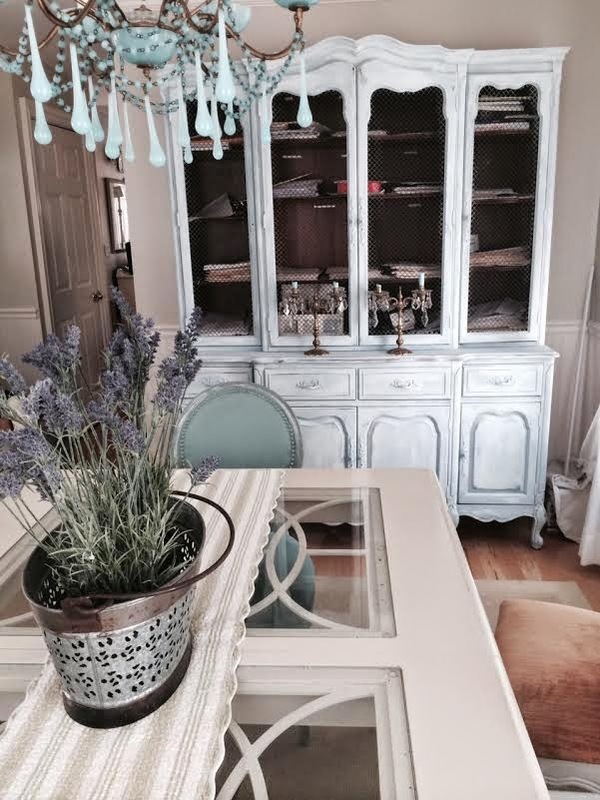 This is a French Provincial cabinet that is in our dining room. storage, mail and filing center for our overwhelming paperwork. Its working out great as our mail and billing center. At any rate, I painted it with Louis Blue Chalk Paint by Annie Sloan. but at this point the difference is huge! 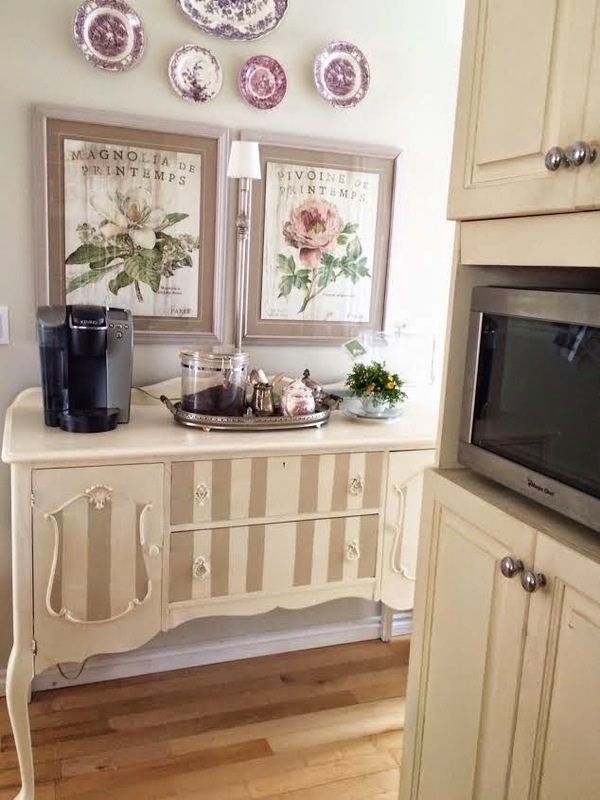 This beat up old stereo cabinet was made over using Annie Sloan's darkest color, Graphite. Royal Design stencils and this is the finished result! Pretty amazing, right? of turning it into a display cabinet for the Efex appliques. people do not realize we applied these moldings! 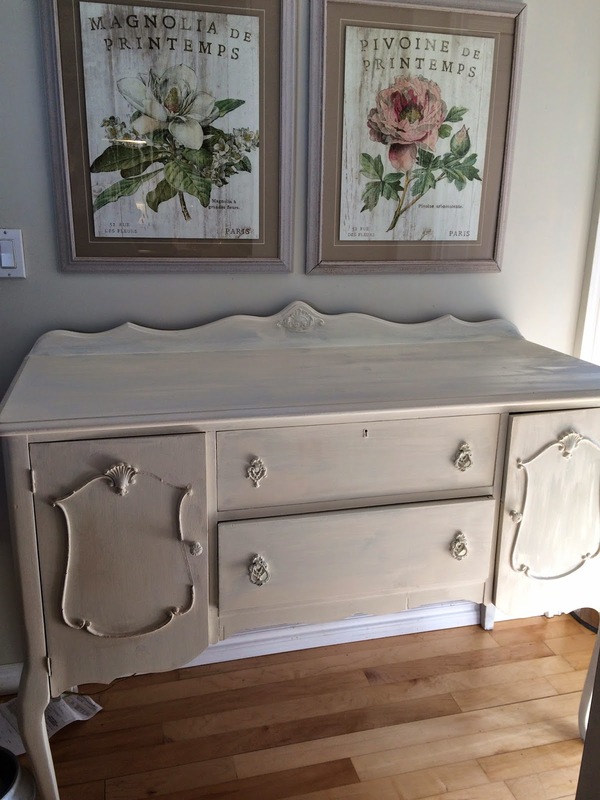 Paris Grey Chalk Paint and finished with Clear and Dark wax. it will be splashed across this blog! But here is a peek of his progress to date. 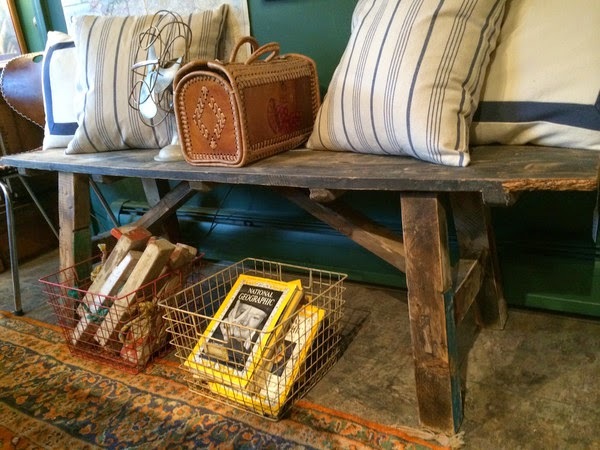 Reclaimed rustic wood furniture has arrived, like our Pioneer Bench. we will sell by appointment. 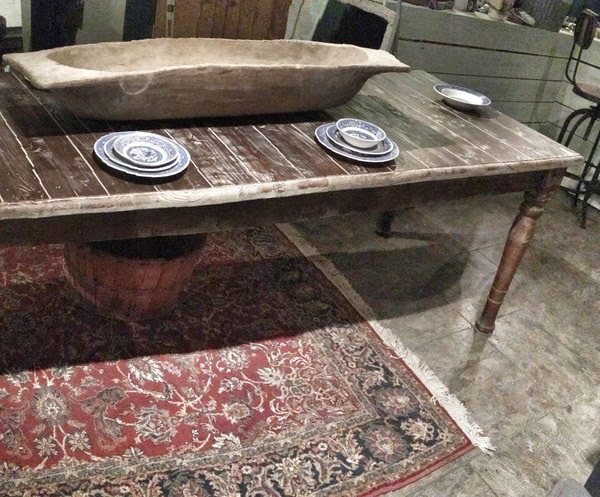 its over seven feet long made out of elmwood. Check out our online furniture offerings here. 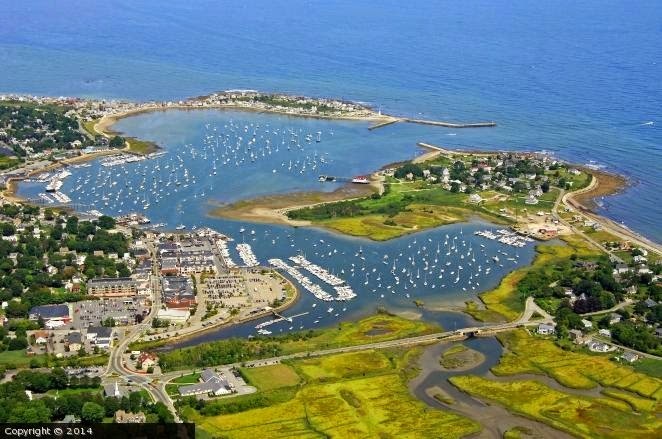 an enchanting little town called Scituate. 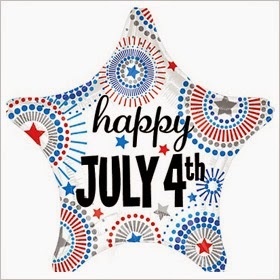 Its on the ocean, and we will be celebrating right on the harbour! 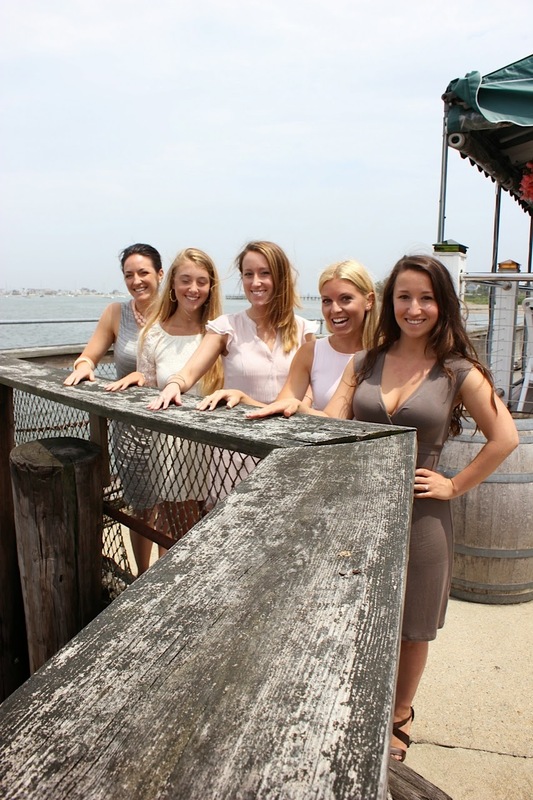 this photo of the bride to be with her attendants. What a perfect day! remembrances, this was a very special day. and take a look at all the newest photos of from my home. I am so happy to be featured on your beautiful blog. 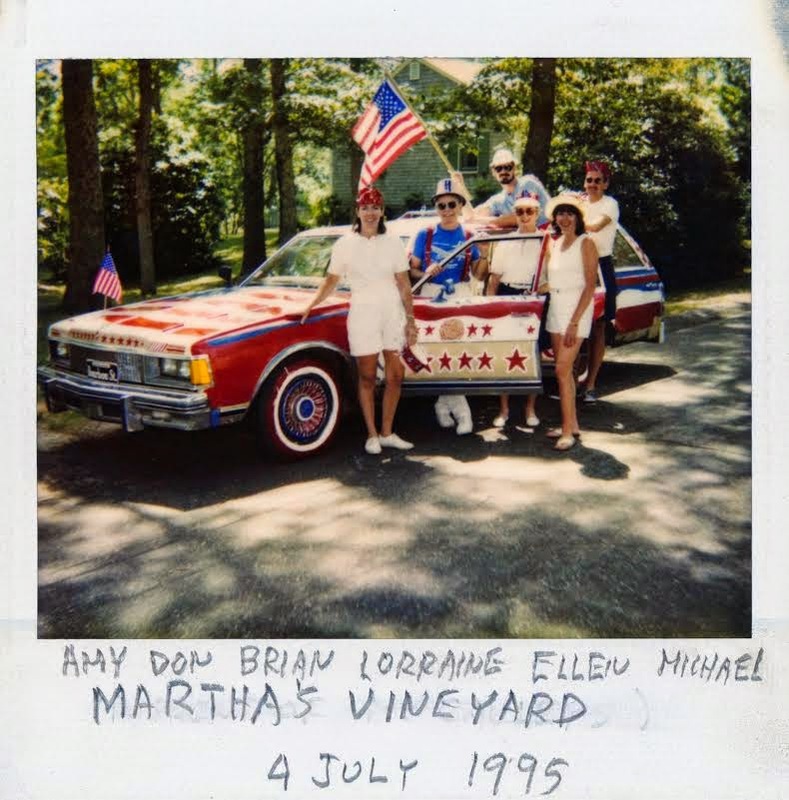 came up from Martha's Vineyard to go to her 60th college reunion! went out with her on Saturday to shop for Justin and Madison's shower gifts. They are getting married in the fall and Madison's shower is next weekend! So I took Saturday off~ Justin filled in so I could hang with mom and Ellen. Ellen took this pic of me ringing up a sale on the ipad while my mom watched. and ring my customers up! Unless its Gina or Cindy or Justin doing the ringing. But I digress...so I had Saturday and Sunday off and I got a lot of stuff done. I finally straightened out my dining room enough to start taking photos in here again. A small pile started brewing in the corner in front of the window there. I had Dillon's kennel in here, and it is big and ugly. I just couldn't stand it, but wasn't sure what to do with it. But today I had a great idea~its in the TV room now! I removed an end table that had a lamp on it that no one ever turned on. 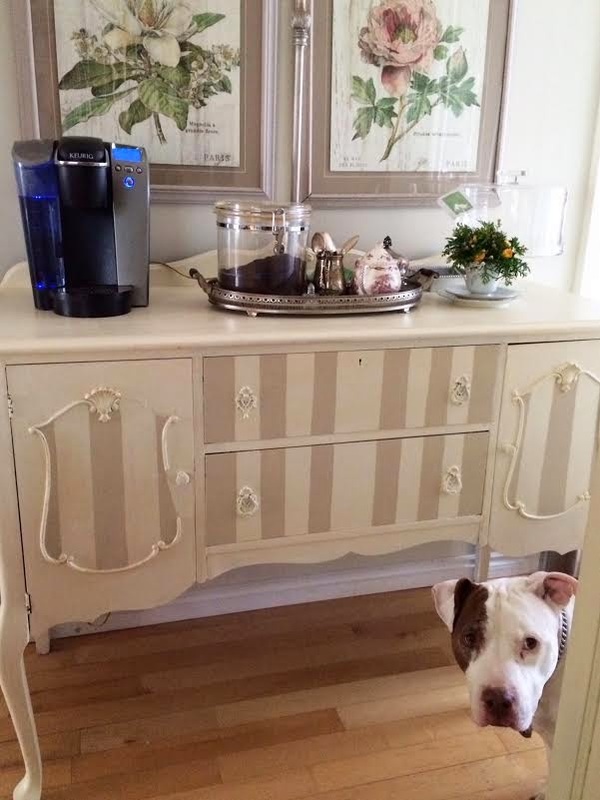 So out went the end table and in its place went the dog kennel and all of a sudden I had my dining room back. And underneath the dog kennel was my old expired Passport! haha! I had put it someplace for safe keeping and couldn't find it anywhere. Well I guess it slipped off a pail of "important papers" that I had on top of the dog kennel and it ended up between the wall and the kennel. Well since it was expired it was no big deal, but it was creeping me out that I couldn't find such an important document. I have a new passport on the way as I plan to travel to France this year. But that's another story. so stay tuned for that on Thursday. No hints. 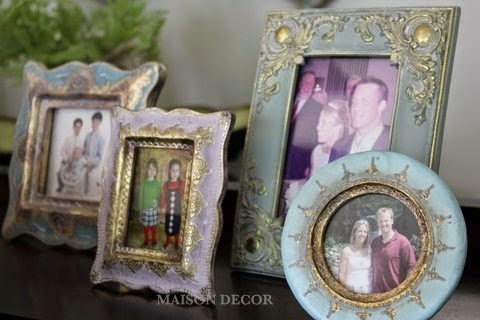 How about these pretty Florentine style frames from HomeGoods? I love that they have a vintage vibe, and they have the colors I love. 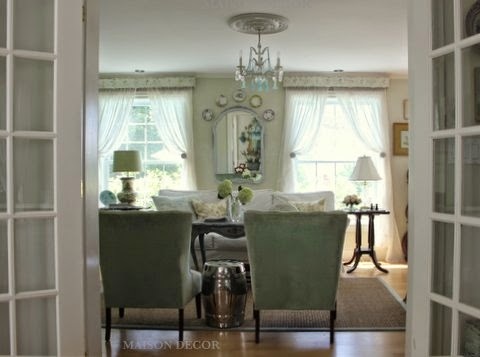 and they tie in to a painted vintage mirror I did a few years ago in aqua blue and green. 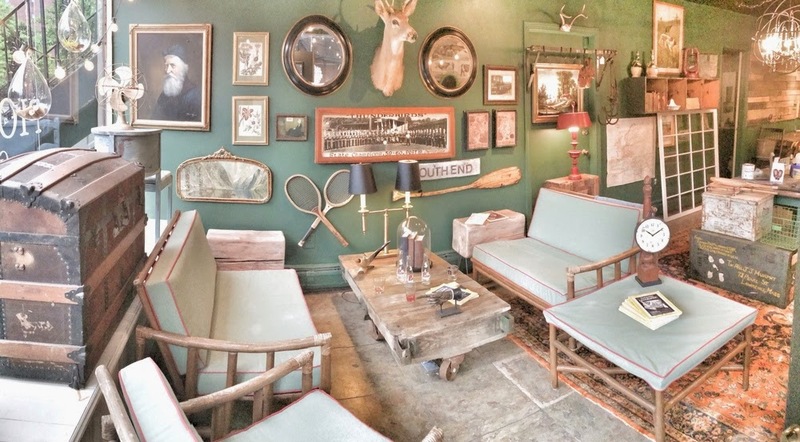 You can see more of this room when I guest post on Thursday! 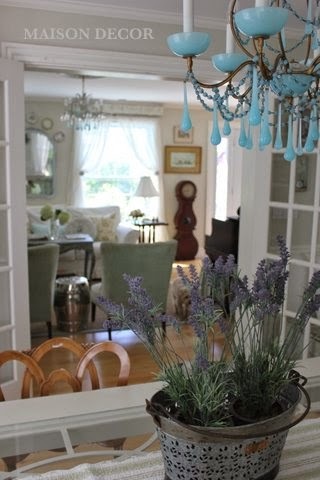 While I was excavating our dining room, and making things pretty in the living room. Mr. Maison Decor was doing the same to the backyard. He is making a big change in the landscape. I am getting so excited about how it is coming out. 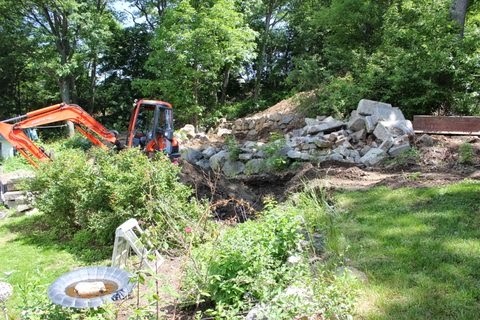 That pile of huge granite blocks will be a big wall and a terraced area!! 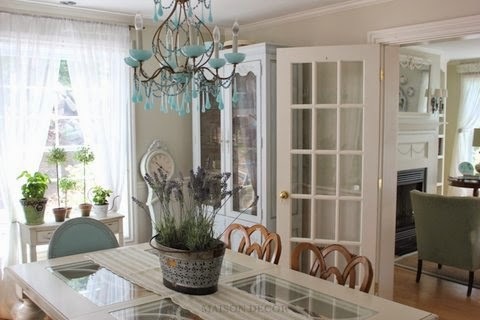 So I decided its time for those French doors in the dining room I have wanted forever. It will lead right out to this space, and I can just imagine how wonderful it all will be. Dillon just had to get up on the couch. Its too irresistible for this guy, so I completely understand. Plus, he's our favorite guy and we love him to pieces. An action shot from earlier in the day~I stripped the wallpaper off the dining room! It came off so easily. I just pulled and it came off in complete stripes and the wall looked great. Better lucky than good, my husband likes to say. But I know I did size the walls, and that makes for easier removal when you go to do this task. 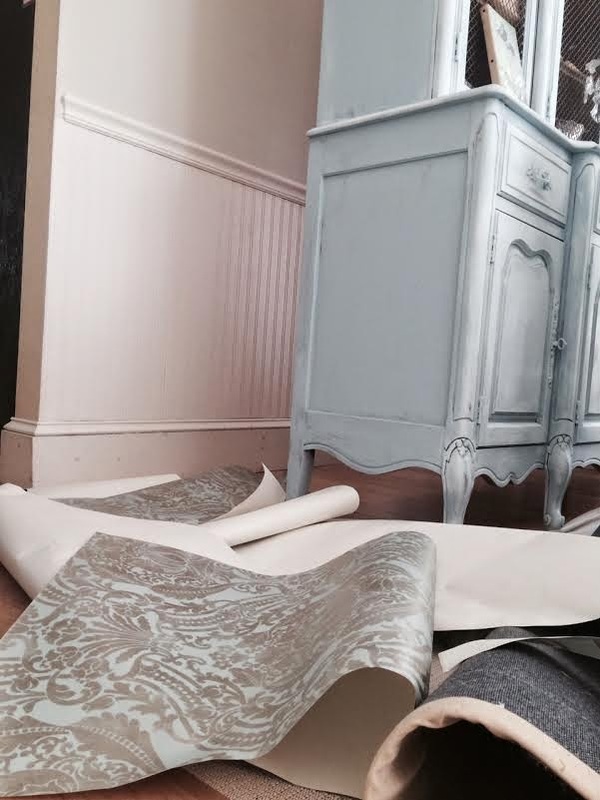 I love love love this paper, but I got the big French provincial cabinet and it just looked silly having the feature wall blocked by a cabinet. So down it came. This is the big cabinet~I am still painting it and deciding upon the finish. When this room gets completed I will do a full post on it. 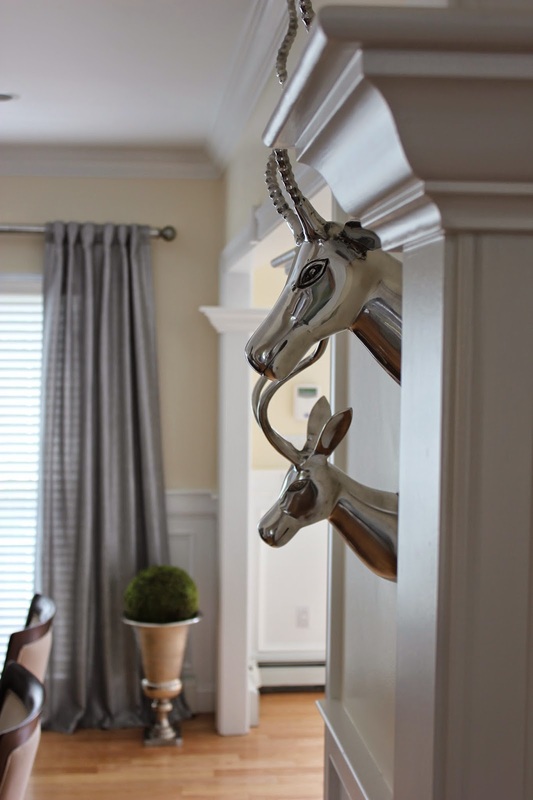 But for now, I am showing off a few snippets of whats going on around the Maison. I am supercharged! I love working on my home! It gets me in a happy place, you know? 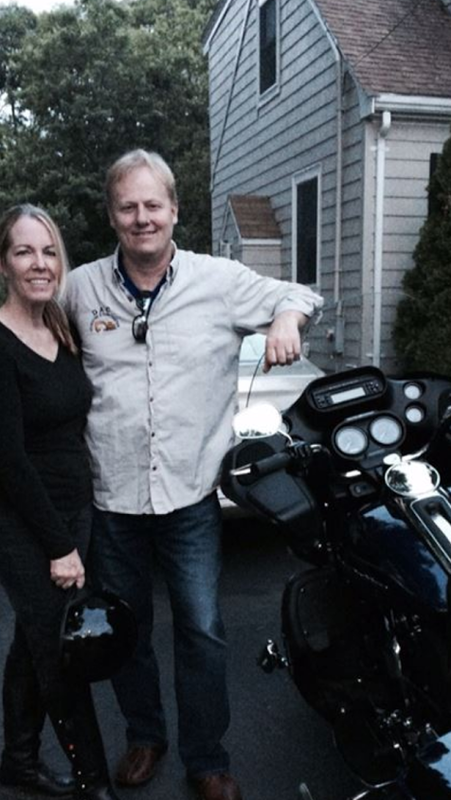 to see my mom and dad at Ellen's house before they headed back to the island. 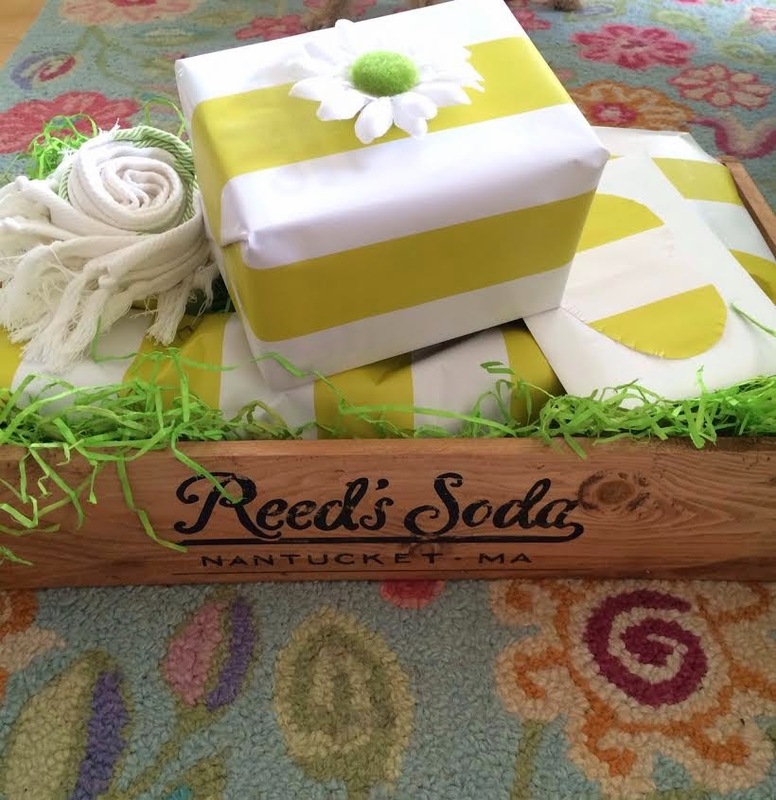 Look how cute the shower gift came out! and packed all the gifts in one of their nostalgic wooden crates. but its a great crate all the same, don't you think? updates later in the week and will spill the beans about whose blog I am guesting on! Note: Part of this post was sponsored by HomeGoods. I am one of their Happy by Design Pinterest board designers! 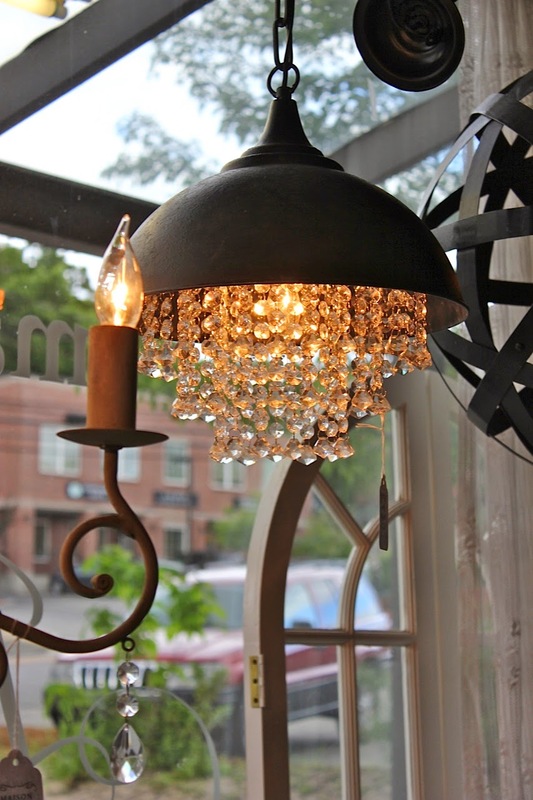 Check out designer tips using items from HomeGoods by clicking here. 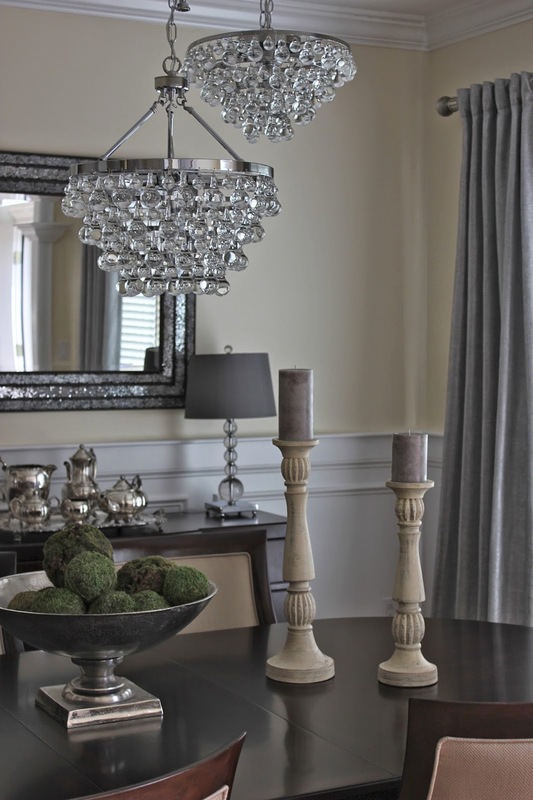 More Efex Applique Projects and Chandeliers!